The Mole Creek Caves are located in the Mole Creek Karst National Park, in the central north of Tasmania about 40 minutes’ drive west of Deloraine. There are two caves open to the public with tours operating every day of the year excluding Christmas day. If you plan to visit both Marakoopa and Kings Solomon’s Caves, remember that it will take about 15 minutes to drive between the two. 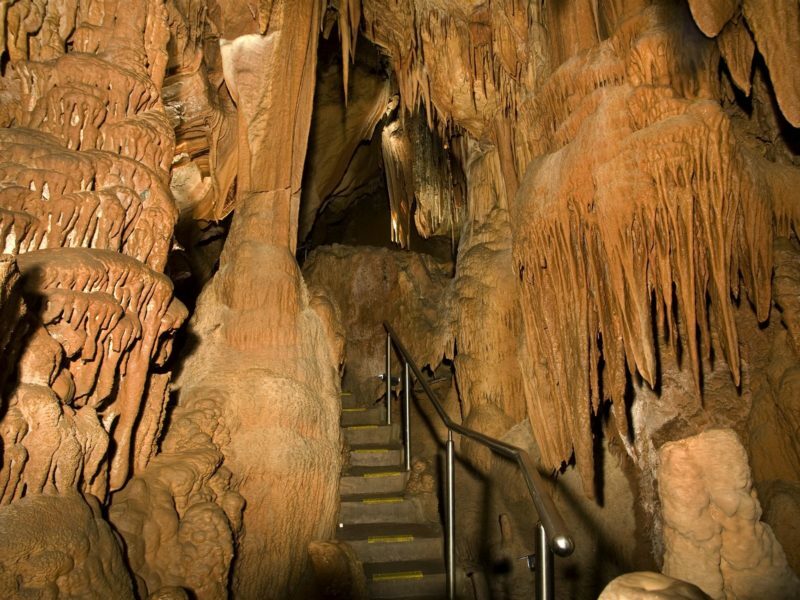 Only cave entry fees apply at Mole Creek Caves, however, National Park entry fees do apply to other areas of the Mole Creek Karst National Park. 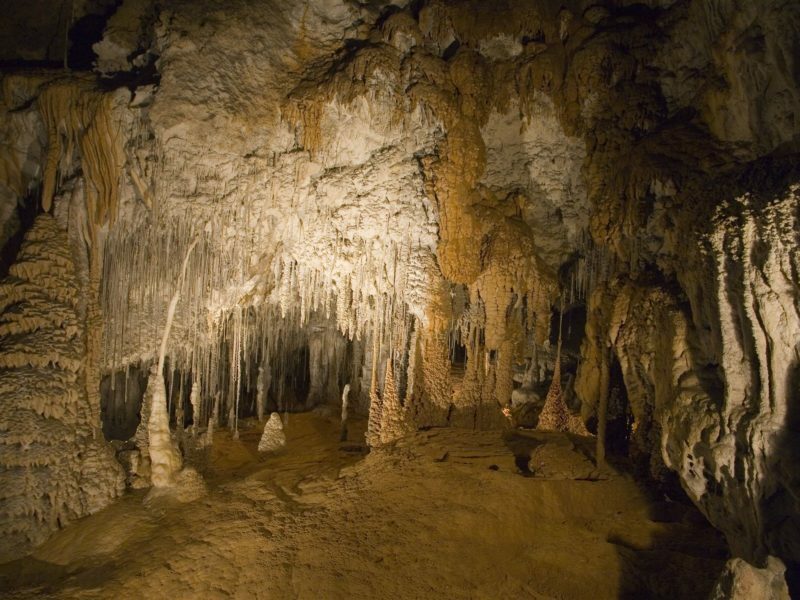 King Solomons Cave, in Mole Creek Karst National Park, is a richly decorated limestone cave. The Mole Creek Karst National Park is in the central north of Tasmania, about 40 minutes’ drive west of Deloraine. This small and compact cave offers lavish colours and a huge variety of formations with sparking calcite crystals decorating the chambers. The cave has high scientific and conservation significance and is home to a number of threatened species. 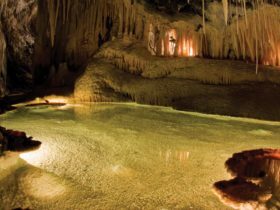 You can view King Solomons Cave and nearby Marakoopa Cave, on guided tours which depart several times each day. The guided tours take about 45 minutes and are suitable for all fitness levels and ages. Picnic shelters, free barbecues and toilets are located close by. If you plan to visit both Marakoopa and Kings Solomons Caves, remember that it will take about 15 minutes to drive between the two. Only cave entry fees apply at Mole Creek Caves, however National Park entry fees do apply to other areas of the Mole Creek Karst National Park. Marakoopa Cave is a limestone cave in the Mole Creek Karst national park. The Mole Creek Karst National Park is in the central north of Tasmania, about 40 minutes’ drive west of Deloraine. Two tours operate within the Marakoopa cave with each tour taking time to view the largest public glow-worm display in Australia. 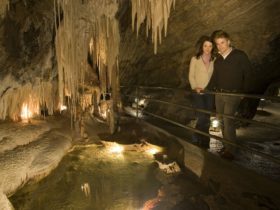 The Underground Rivers and Glow-worm tour will take you to the lower chamber with its sparkling crystals, reflection pools, stalactites and stalagmites. Take time to wander down abandoned river passages. This tour caters for all age groups and levels of fitness. The 45 minute tours take place several times a day, every day except Christmas Day. Bookings are not accepted for individuals but are required for groups of 10 and over. The Mole Creek Karst National Park is in the central north of Tasmania, about 40 minutes’ drive west of Deloraine. Two tours operate within the Marakoopa cave with each tour taking time to view the largest public glow-worm display in Australia. The Great Cathedral and Glow-worm tour will take you to the largest public chamber of the cave viewing sparkling crystals, flowstone, stalactites and stalagmites along the way. The ‘Gardens’ feature delicate formations and beautiful contrasting colours. Medium fitness levels are required for this tour to ascend the stairway to the “Great Cathedral”.